EFI Self-Serve Print Technologies now Integrated with CBORD Campus ID Card Systems. The EFI Self-Serve M500 Copy and Print StationEFI™ has announced the integration of its EFI Self-Serve M500 Copy and Print Station and EFI Self-Serve AdminCentral with CBORD's CS Gold® and Odyssey PCS™ campus ID card systems. With the integration, colleges and universities can gain streamlined, automated management of student and faculty print and copy payment systems. "A growing number of universities are saving time, money and management headaches by using the EFI Self-Serve M500 systems to provide student and facility print and copy operations," said Micah Kornberg, vice president, self-serve products, for EFI. "It is exciting to take this level of automation even further by integrating with CBORD's advanced ID card technologies." One EFI customer, Barry University in Miami Shores, Fla., added M500 systems in part to address printing needs based on the proliferation of student mobile device usage. The university has faced a 400-per cent increase in devices connected to its wireless network, and its printing capabilities could not keep up with the increased print demands those devices created. Two years after adding EFI systems, Barry University is able to efficiently manage printing for thousands of pages each month with multiple Self-Serve M500 Copy and Print Stations. The university expanded printing capabilities to its student union and residence halls, and print usage has consistently increased, without overburdening the university's information technology staff. "Students seem pleased with the ease of printing," said David Duvall, director of client services information technology for Barry University. "It has helped that we no longer have to train new students on how to print - the system is intuitive and simple for them to use. The M500 station has been much simpler to use from a management perspective as well." The flexible system EFI presented at CBORD's user group conference allows printing of anything from PDF and Word documents to images and PowerPoint presentations from a USB drive; mobile phones; tablets; laptops; email; cloud-based services like EFI PrintMe®, Dropbox and Google Drive; or a campus computer. 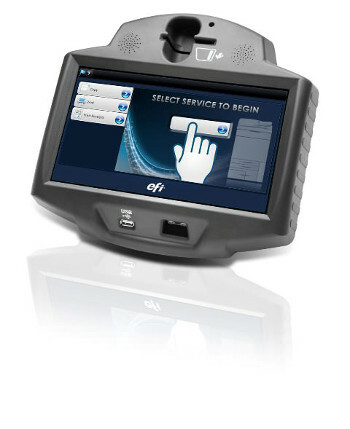 EFI Self-Serve AdminCentral, a cloud-based Web application, lets administrators easily set up M500 stations in minutes and manage multiple stations anywhere, anytime with just a Web browser. Administrators can configure devices, add services without changing hardware and set or adjust prices and tax rates. They can also generate detailed sales and usage reports, monitor real-time device status, and update device software online. In addition to adding CBORD CS Gold and Odyssey PCS integration, the latest version of EFI Self-Serve AdminCentral adds Microsoft OneDrive support. For more information on the EFI M500 Self-Serve Copy and Print Station, or the EFI Self-Serve AdminCentral cloud-based management system, visit efi.com/m500 or follow us on Twitter at @Mobile_Print.